My husband LOVES hot sandwiches, so this one is very popular around our house. I have got to remember to start making him 2, he was still hungry after this, and I only unthawed one kaiser roll! Sorry honey! This is another one of my pot roast morphed meals from this weeks meal plan. We had Ore-Ida steak fries with this, no we didn’t have any fruit or veggie for dinner! We’ll make up for it tomorrow night. Below is a picture of what they looked like right before I put them into the oven. 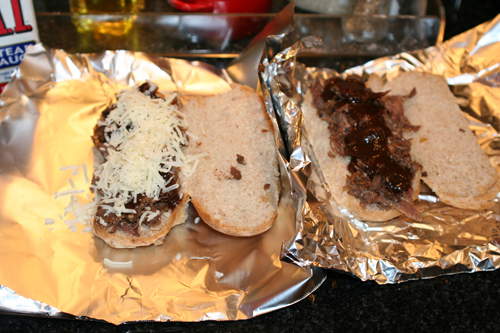 Cut rolls in half and layer with beef, sauce, onions, and then cheese. Wrap in foil and cook for about 15-20 minutes.